I survived my first week back at work, and my daughter's first birthday party! My time for genealogy is more limited now, but I think I have made some progress (however small) in the past week. I have written out a list of questions I would like to answer about my great-grandmother, Elizabeth TREGONNING and I have a loose plan in mind for how I will answer them. I have also made progress in gathering information about her (in line with my plan!). I have confirmed that neither of her two children born before she married my great-grandfather had any children themselves. Both these children died of tuberculosis during her lifetime, although many years apart. Her daughter, Violet Adeline TREGONNING, passed away a month short of her 12th birthday in 1898 while her son, Albert William TREGONNING, died at age 54 in 1939. They both died in hospital - I wonder if there are any hospital records? This leaves the five children she had with my great-grandfather James Henry FRENCH. I know that three of these had children, and I am reasonably sure that one didn't have children. The other, I don't know. There are potentially quite a few cousins out there who may have information or photos that I couldn't get from anywhere else. If you are one of them, please get in touch! I said in my last post that I was going to concentrate my research on Elizabeth TREGONNING. Out of the 97 ancestors currently entered in my database, why choose her? She was born in Australia, and I want to concentrate on Australian research before doing too much overseas. Finding her death certificate was a challenge. Thinking about her through the years that I looked for it made me curious to know more about her. I know enough about her to think her life may be interesting. I know enough about the parent-child connections from her to me to be sure she is my ancestor. I have not yet found any other researchers with a direct interest in her. If I don't research her, who else will? I know she has other descendants (aside from my first cousins), but I've never contacted them. Who knows what letters, photos or other treasure they may have?! She lived to 94 years of age, dying in 1952. There is a chance that some of her other descendents may have met her and could tell me some of the personal things that you can't find in documents. I'm excited about this. I feel like I'm doing proper research again, and I haven't even begun! This is not a farewell post! I have to go to work on Monday, for the first time in over a year. I've been on unpaid maternity leave. Although my return to work helps our household income, it will cut the already limited time I have for genealogy. I've been thinking about how I spend my time, and what I would like to achieve. There's a mismatch between the two. I know I spend too much time flitting from thing to thing. I've blogged about that before, but not actually done anything about it. Yes, I've kept occupied, and it's been interesting, but it has not moved me towards a family history on even a branch of my tree. Knowing how much more limited my time will be has helped me to make a decision... I am going to concentrate on Elizabeth TREGONNING (1858-1952). What's more, I am going to plan both my research, and how I spend my time. When I get - no, make - time for genealogy, I will follow my plan. I'll allow myself a little 'unstructured' genealogy time as well. After all, I do this for fun! But I will not change my mind about where my main focus is, or how most of my time should be spent. Next time - Why I picked Elizabeth TREGONNING. "Oh really?! What a pity. I'm sorry to hear that. Well, thank you for telling me. Goodbye." She turned back from the phone. "That was someone calling to tell me that my sister had died!" This stunned me. I didn't realise my grandmother had a sister. "Oh... I'm very sorry to hear that Grandma!" Her reaction was not quite what I expected. "I thought she died years ago!" Needless to say, Grandma had not been close with her sister. They'd had some sort of quarrel many years earlier, or perhaps they just didn't get on. You could say that explains why I didn't know about the sister... but what about her seven other siblings?! Grandma was the youngest of nine, seven of whom lived past childhood. Her other siblings had passed away by the time I was old enough to pay much attention to family connections. Grandma was never one to talk much about the past. I'm glad I persuaded her to talk me through her family photos, just the once, before she passed away. I'm trying to find a look that suits both me, and the content of this blog. I've tried to choose a look that's clean and simple. A fussy frilly look is just not me. I don't dislike frilly looks, but they've never really worked for me. Those pink spots that I had until now didn't sit right with me, and I think they slowed up the page loading. I think this look is more comfortable for me, at least for now. If you want to overanalyse it, you might say that green and brown represent the muted colours of gumtrees, which in turn represent both (family) trees and Australia. The purple headings are just because I like purple. I'd like some feedback, if you don't mind. Does the new look work for you? I'm not aiming to set anyone's world on fire, just to have something that's comfortable to read and doesn't jar given the content of the blog. My apologies for the poor quality of the photo. I only had my mobile phone with me. The roadworks didn't help much either! There had been a few changes since I was last there. The most surprising change was the appearance of a little sandwich kiosk in the space outside the newspaper and microform, and maps rooms. The most welcome change was the ability to scan directly from the microform readers and email the image to yourself, all at no cost. This could save me a fortune in photocopy charges! Actually I didn't email the images to myself, I uploaded them directly to my Dropbox account so they would be waiting for me on my desktop computer when I got home, sitting in the correct folder, with no further effort on my part. Nice. Very, very nice. So what did I find? Well, my main aim was to see the passenger list for Richard ROBOTHAM. I recently wrote about how I found him in the passenger list index. The ship was the "Red Jacket", travelling from Liverpool to Melbourne from January to April 1860. Onboard were 338 adult passengers and 49 children. From a quick scan of the list, Richard ROBOTHAM was one of the oldest passengers, at the advanced age of 41. Most were in their 20s. I was hoping for some detail that would let me know if this Richard ROBOTHAM was "mine". Sadly for me, there was no additional telling detail beyond the basic demographics they recorded for unassisted passengers (ie those who were paying their own way). On the other hand, there were some minor inconsistencies with what I know of "my" Richard ROBOTHAM. The Richard in the passenger list was listed as single but my Richard was married. However, as he was travelling on his own I don't expect that they took down that information very carefully. He was also listed as travelling to Auckland, but it seems feasible to me that he could have changed his mind during the 3 month voyage, and decided to stay in Melboune. What a pity there's just nothing to tell me for sure that I've got the right man. I'll just have to put it down as a maybe for now. 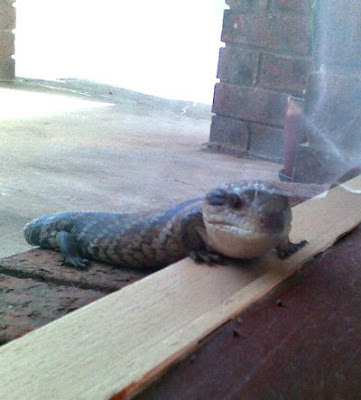 He listened patiently while I told him about my research trip, then wandered off again. I'm planning a research trip next week. Sounds exciting? For me it is, but maybe not so much for anyone else. Unfortunately I won't be travelling to some far flung (or even nearby location) to see the original records myself, learn about the local history, walk on the ground where my ancestors trod and generally soak up the atmosphere. I'll just be visiting the library. I recently wrote that I had found Richard ROBOTHAM on a passenger list to Australia. 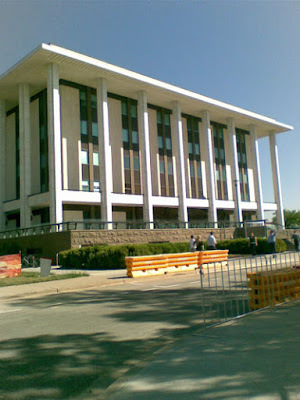 The microfiche is available at the National Library of Australia (NLA). Although the library is only 20 minutes away, I haven't had a chance to do this sort of thing in the last few years. It's hard to get out of the house without at least one very small person along for the ride. So, for me it's exciting. Am I ready for it? Well, I have printed out my NLA 'to do' list. It has many more items on it than I will have time for. My plan is to look at Richard's passenger list first. Anything else I find will be a bonus! I have a small laptop with my database (nicely synced with my desktop version via Dropbox) to check up on details... I found my NLA readers card... Yes, I think I am! Q: What does this beach have to do with my genealogy? A: Nothing that I'm aware of. 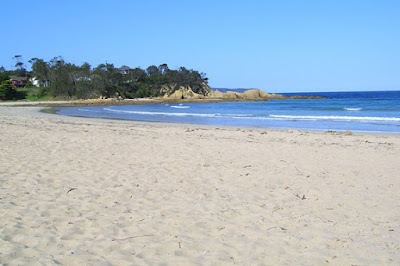 It's Broulee Beach, New South Wales. I was there last week, on holiday. In the evening, when the children were asleep, we quickly gave up on television and settled into other quiet activities. I had my laptop, but only a very expensive pre-paid mobile internet connection. The internet famine turned out to be a good thing for my genealogy. Before I left home I installed Dropbox on both my desktop and laptop. I had been meaning to try Dropbox, and this was the perfect oppurtunity. Dropbox synchronises files between your computers and acts as an offsite backup. It has a few other claims, but the effortless file synchronisation was the feature of interest to me. I was very pleased with how it worked. I made sure that I turned Dropbox file checking and synch off while I was away, so I wouldn't waste my limited internet connection. I turned the file sync back on again at home and my changes appeared on my desktop computer with no more effort by me. Easy. The files I worked on were pages from the Australian Electoral Rolls, which I had downloaded from Ancestry two years ago. I had 107 pages, each with 1-5 people of interest. For each person the rolls give the name, address and occupation. As Australia had (and has) compulsory voting, they are very nice for following people's movements and career changes over time. I made a start on the data entry back in 2007, but couldn't face doing the rest. While I was away, I managed to enter 3-4 pages each night. I still have 61 pages left to go, but the task doesn't seem quite so daunting. I just have to make sure I keep chipping away at it. I'll talk more about how I'm using the Electoral Roll information another time.